Since 1991, Professor Sir Charles K. Kao founded the Faculty of Engineering in the Chinese University of Hong Kong. To commemorate the 25th Anniversary of the Faculty this year, we are staging a series of celebratory activities to share the joy with our students, alumn and friends. 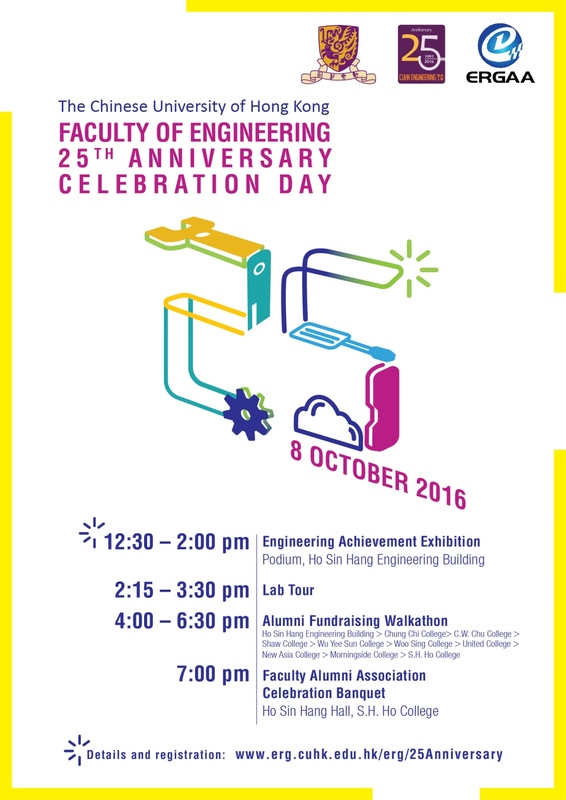 The celebration day will embark on the Engineering Achievement Exhibition where you can find out some of our featured technology breakthroughs and innovations at the Podium, 5/F, Ho Sin Hang Engineering Building (SHB). Our alumni and students will lead a lab tour that allows you to go more in depth about each project demonstration by specific departments. Tour lasts about 1 hour and ends half hour before the Alumni Fundraising Walkathon begins. The finale of our 25th anniversary is the Faculty Alumni Association Celebration Banquet. It will be a great reunion for each and every one of you, not just reconnection with old friends, but also connection to new faces. And the lucky draw grand prize is a i-watch. Seats are limited, please act fast to secure your own table.